We all aspire to live a better life, especially if you’ve been born in a developing country whereby some of the most basic amenities are so hard to come by. Over the years, the western world has seen a surge of immigrants looking for greener pastures and a better life for their families. And at the core of this dream is the application process; more specifically, writing effective immigration recommendation letters which you can do so with writing LoR service. Initially, the hope for the American Dream had pitted the United States as the most popular country for immigrants to relocate and start their lives afresh. However, with rising racial tensions, a more conservative government, and stricter policies being put in place, immigrants have started turning their attention elsewhere to more favorable countries of destination. Some of these countries that are now gaining popularity include Canada, the United Kingdom, Australia, Germany, and New Zealand. Why Do Immigrants Move to Western Countries? There is a number of benefits of moving from the developing world to the developed world. Keeping this in mind, here are some of the benefits that you are bound to experience. A mature democratic system. Most of the countries deemed as the western world has a highly sophisticated and developed democracy system. This enables power to be distributed effectively among various facets of the government. Additionally, power is given directly to the people to elect their leaders and representatives in government meetings. Such a democratic system forces leaders to be more responsible with their actions and to put the interest of the people first. In fact, you will find that it is nearly impossible for leaders in developed countries to abuse their power as they can easily be impeached and replaced by a competent individual. The same cannot be said in developing countries where leaders abuse their power and silence anyone who tries to oppose their right to rule. Peace and freedom. As a result of having a mature democratic system, countries in the west tend to be more civil in leadership roles. This minimizes issues of corruption and abuse of power. In the end, no political divide will feel as if it is being undermined. When all parties in the political sphere are confident of the democratic structures put in place, they tend to be freer with their speech and less likely to resort to violence to solve a particular crisis or situation. Quality education. The western world has some of the best learning institutions in the world. This enables hundreds and thousands of individuals to gain the necessary skills, knowledge and thought the process to become productive individuals in society. Additionally, a thriving economy gives these individuals the opportunity to earn a decent living and to make a great life for themselves. Quality healthcare and nutrition. Last but not least, countries such as Canada have some of the best and most affordable healthcare systems in the world. It is such a setup that allows individuals to live longer, and more productive lifestyles as compared to their homeland countries. 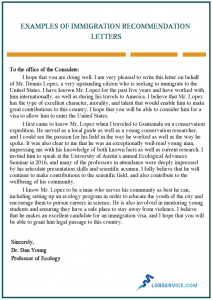 Why Is It Important Writing a Letter for Immigration Recommendation? 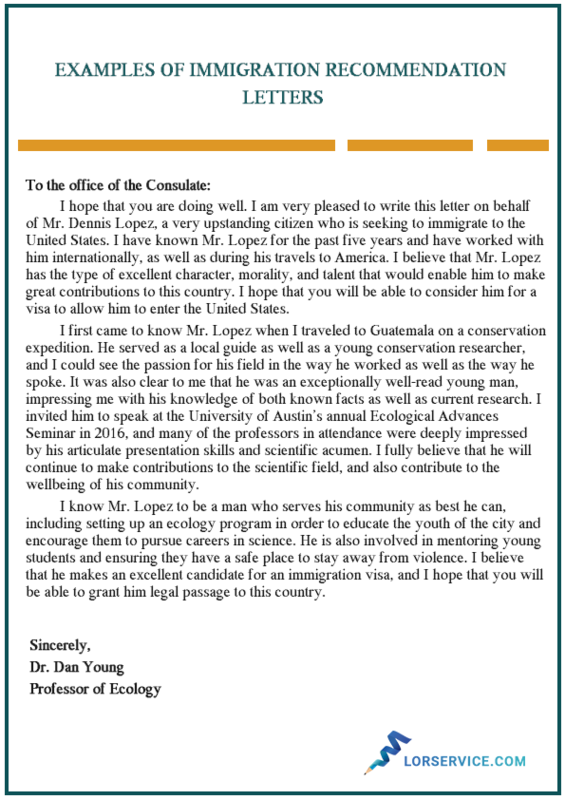 A recommendation letter is vital to the country that you’re immigrating to because it lets them know what your intent and purposes for immigration are. Bear in mind that not all potential immigrants come in search of a better lifestyle. Some have underhand aspirations which could be dangerous to the citizens and individuals of a particular country. Keeping this in mind, here are some of the reasons why recommendation letters are extremely important. To show intent and purpose. One of the reasons why writing a letter for immigration recommendation is vital is because the country that you’re applying to needs to know your purpose. Are you seeking asylum, looking for a work permit, or looking to come as a part-time student? As you are aware, there are different levels of immigration that you could be applying to depend on your current predicament. To prove the relationship. Additionally, you could be applying as a dependent to one or more individuals that have already gotten citizenship to the country that you aspire to go to. If this is the case, then your recommendation letter is one of the areas where you can iron this out and let the immigration department know your current status. To confirm an employment opportunity. So you happen to be an international hire and just got the green light for a job opportunity in another country. If that’s the case, then you’ll need to confirm this in your immigration recommendation letter from employer to let the immigration department know that you have been contracted and require a work permit. The great thing about such an opportunity is that individuals going to work are given a much higher priority as compared to individuals who are not obtaining immigration based on a work permit. How Do You Go about Writing an Immigration Recommendation Letter for a Family Member? Here are some of the ways you can prepare writing a recommendation letter for immigration if you are a potential individual who should write letters of recommendation for immigration. Also, check how to write letter of recommendation to know more about it. First things first, you need to understand the kind of immigration process that you are targeting. There are different types of immigration options depending on what you are targeting. For example, if you are applying for citizenship, then you will have to gear your recommendation letter towards such a cause. Additionally, if you’re applying on the basis of refugee status, then it would be great for you to gear your services towards such a cause. Additionally, if you’re applying for a student or tourist visa, then your immigration recommendation letter should be geared towards such a cause. That being said, you should do credible background research on the type of immigration that you’re targeting first before applying to it. Have a discussion with the requestor. Your requestor is one of the government officials that you are assigned to when you’re making an application to the immigration department of your choice. That being said, before writing your recommendation letter, you should communicate with your requestor to determine all the requirements and necessities that are required in your recommendation letter. Additionally, you should make it a point to gather as much information as you can from your requestor before applying to your job of choice. Have a look at samples online. Last but not least, as a letter applicant, you should check out examples of immigration recommendation letters online regarding the specific type of immigration status that you are applying for. In fact, there are plenty of detailed examples to which you can determine how to go about your recommendation letter. Additionally, by having a look at some of these recommendation letters, you can avoid some of the common mistakes that individuals make with these letters such as spelling mistakes, grammatical errors, and the wrong use of phrases and sentence structures. Just like other recommendation letters, your letter needs to begin with an introduction, body, and conclusion. In the introduction, you can introduce yourself and talk about certain specifics regarding your background. Last but not least, the conclusion is where you sign off after stating your reasons for the application. Ensure to be professional in your sign off and you can live simple remarks such as looking forward to the department’s response. That being said, you can have a look at some of the most frequent instances in which an immigration letter for a friend is required. Canada. Being that Canada is the world’s most popular immigration destination, writing a superb immigration recommendation letter requirements is of utmost importance. In fact, did you know that one out of every five Canadians is an immigrant? Indeed, the country accepts up to 300,000 immigrants every year. Keeping this in mind, you should gear your recommendation letter to improve your results. USA. If you plan to immigrate to the United States, you should be keener because the country currently has some of the strictest immigration policies after the Trump administration took office. Evidently, the country is looking for skilled immigrants who are able to provide high-end services to the economy. That being said, it shouldn’t deter you from making an application geared to convincing them to accept your immigration status. New Zealand. New Zealand is one of the greatest countries in terms of standard of living, primarily because the country has one of the most stable economies in the continent of Oceania. Indeed, you can make an application for immigration, but make sure you have a great reference letter for immigration to ensure that you improve your chances of approval. Australia. Australia is one of the most developed countries in the world with high minimum wages for labor workers as well as professional workers, see more about professional recommendation letter for a colleague. Additionally, the country is known internationally as having one of the best education systems in the world. United Kingdom. Over the years, the United Kingdom has had one of the greatest numbers of immigrants thanks to its highly developed education system, healthcare, and wealth. That being said, since its subsequent exit from the European Union, the country has become relatively stricter with its immigration policies. Which means that you should be focused and pay attention to detail when writing your recommendation letter. Here are the different types of visas that you can get after writing an immigration recommendation letter for a friend. Non-Immigrant Visas. A non-immigrant visa is one whereby you move to a country for purposes of work, tourist visit, or educational purposes. Individuals that apply for a non- immigrant visa need to gear their recommendation letters according to their specific purpose of moving to the specific country. Immigrant Visas. As for an immigrant visa, you could either be applying as a refugee or as an individual looking for citizenship for a better lifestyle. That being said, you have the option to argue out reasons for your application in the recommendation letter and why you feel you can capitalize on the opportunity to gain citizenship to the country of choice. How Can Our Services Help with Your Immigration Letter? That being said, here are some of the ways in which our services can assist with your visa. Quality writing. One of the features of your immigration application is that it needs to have great MBA recommendation letters to improve your chances of successful admission. That being said, when you get in touch with our service, you can ensure successful admission thanks to the quality writing service that we provide to every individual that gets in touch with us. Unlimited revisions. If you’re not satisfied with the letter of recommendation for employment that we first deliver to you, you have the opportunity to request as many revisions as you would like to request. This way, you can ensure that the final product is up to par with what you had expected to have for your application process. Affordable services. Additionally, we provide our writing services at an affordable price to enable you to get your most ideal recommendation letter without causing a dent in your wallet. That being said, if you’d like to get a comprehensive recommendation letter for immigration today, as well as how to write a letter of recommendation simply get in touch with our immigration recommendation letters services.